Windows Experience Index (WEI), introduced with Windows Vista and present in Windows 7 as well as Windows 8, evaluates the performance CPU, RAM, disk drive, graphics card, and gives a score between 1.0 to 9.9. PC users who have upgraded from Vista, Windows 7 or Windows 8 to Windows 8.1 will immediately notice the absence of Windows’s built-in benchmark system. Even though Microsoft hasn’t completely removed the feature from the latest version of Windows operating system, the GUI version of the WEI isn’t available. In other words, the WEI doesn’t appear in the System Properties window. 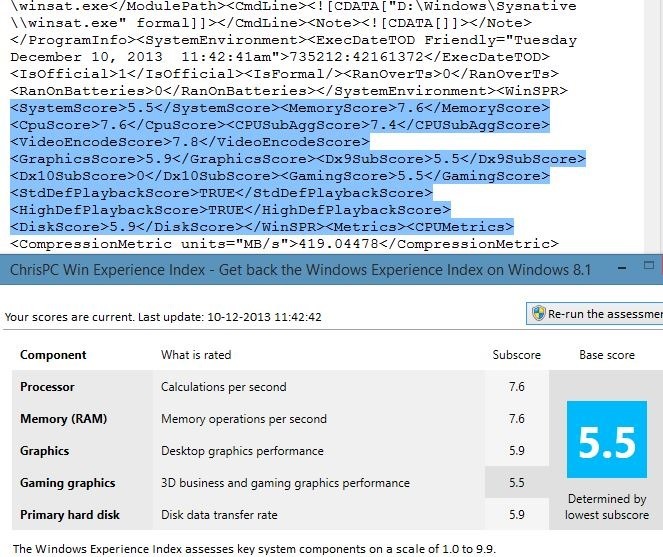 A couple of months ago, we covered how to view the Windows Experience Index (WEI) score in Windows 8.1 by opening Formal.Assessment (Initial).WinSAT file located in Windows\Performance\WinSAT\DataStore folder but the method requires you manually open the Formal.Assessment file every time to view the score. PC users who’re missing this benchmark system in Windows 8.1 and want to get the GUI version of Windows Experience Index will be happy to hear that a new third-party program is now available to enable the GUI version of Windows Experience Index in Windows 8.1. ChrisPC Win Experience Index is a free tool designed to help you get back the Windows Experience Index in Windows 8.1. As you can see in the below picture, it shows WEI score for processor, memory (RAM), graphics, gaming graphics and primary hard disk. For those of you wondering, this tool scans the Formal Assessment (Initial) WinSAT file to display the WEI score for your PC’s components. In other words, this tool doesn’t scan your PC’s hardware to give a score but simply scans the original WEI file located in DataStore folder. An option to re-run the assessment is also available after updating hardware or drivers. The only downside (not exactly a downside) of this program is that it’s not portable, meaning that you need to install the program to view the score. Note that it doesn’t add WEI to system properties and you need to launch ChrisPC Win Experience Index to view the score. How to create Windows 8.1 backup image and how to restore the image backup guides might also interest you. Thanks Mike for letting us know about the release of this software. Thanks a lot guys. Awesome. (Q43 Express chipset, integrated graphics, E7500 processor) gaming performance: 9.9! Processor performace: 8.2! on Windows 10 64 bit. Originally in Windows 7 (32 bit) there was the gaming performace: 3.5, Processor performace: 6.4.